Honda UK has started buying presents for their 50th anniversary early. 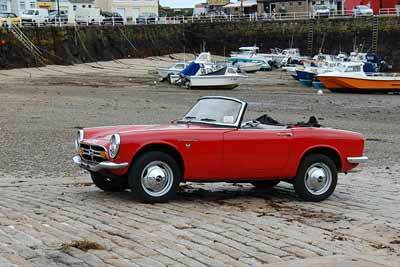 The first, a classic S800 sports car restoration project. Honda bought the red 1967 S800 to add to their growing heritage press fleet, with Jersey-based Le Riche Automobile Restorers being called in to help. After almost 50 years of use, the little S800 is currently suffering from rust and the usual wear and tear. In rebuilding the car, Honda UK are keen not to “over-restore” it, wanting the end-result to be authentic. The aim is to sympathetically refurbish the car to a condition that reflects its age. The rebuild should be ready in time for the Goodwood Festival of Speed hill next June. Honda say the car will then be used as a rolling showcase of the company’s history at events around the UK. Capable of reaching a speed of 100mph, the S800 derived its power from a high revving 800cc engine (that redlined at 10,000rpm) derived from Honda’s motorcycle division. Production of the S800 ended in May 1970 after almost 12,000 cars had been produced. It would be nearly 30 years until Honda made another S roadster, with the release of the S2000 in 1999.